If you need to cover a seasonal peak, prepare for an upcoming event or just deal with the fact that your order books are full, you will need to make it as easy as possible for your workforce and machinery to manage the extra workload. Our short-term “Linde Rental Solutions” are on hand around the clock to work with your company as a reliable partner. Wherever you are in the world, you can rest assured that we will have just the right forklift truck, warehouse handling equipment or fleet you are looking for, and you know you will be getting state-of-the art technology and the usual Linde quality. Our service allows you to react to additional demands, last-minute changes and unforeseeable events in an appropriate and cost-effective way. Anywhere Linde can be found, you can be sure that special short term rental fleets adapted to suit local customers' requirements are not far away. Our approach combines globally recognized standards with adjustments made in response to the local needs. The result is the ideal solution in the form of flexible rental options ranging from one day up to one year. What's more, the Linde rental solutions also provide a straightforward and practical way of testing out Linde trucks. If you have a lot to move, you need reliable technology that has been adapted with your company's operating conditions in mind. The electric forklift trucks, IC trucks and other logistics trucks in the Linde short term rental fleet are all state-of-the-art pieces of equipment. Qualified Linde service technicians regularly check and service the trucks in the rental fleet and ensure that they are in line with the highest of quality standards. Linde makes the whole process nice and straightforward, meaning that help is available quickly – ideal for managing short term capacity fluctuations. The wide range of Linde rental equipment on offer gives companies the chance to respond to almost any logistics requirements in no time and ensure their operations run smoothly. Alongside forklift trucks and warehouse handling equipment, the Linde rental solutions give you access to other more specialized trucks and equipment whenever you need to use them on a temporary basis, including container stackers, special trucks, work platforms and accessories. This diverse range allows companies to put together their very own fleet that runs like clockwork. Linde Material Handling will be on hand to provide you with help and guidance every step of the way, from the moment you make your rental inquiry, throughout your individually arranged rental period, right up until you return your rental trucks. 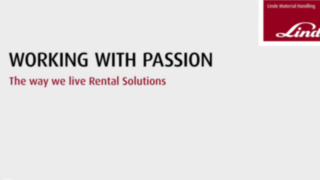 Linde is a partner you can rely on before, during and after we provide you with the perfect rental solution to suit your requirements. Availability: Linde's rental service network is so extensive that you can always be sure to find a professional contact person near you. Reactivity: Our experienced Linde team will quickly offer a flexible solution to meet your individual and specific requirements. Industry knowledge: Linde‘s rental team is up-to-date on the latest technology and is also familiar with specific industry requirements to provide professional assistance and the best rental solution. Availability: Each Linde location has an exclusive and modern fleet of trucks available for short-term rentals (between one day and one year). Comprising more than 60,000 trucks, Linde‘s global rental fleet covers all kinds of requirements with ease, no matter how specific the requirement is. Flexibility: The duration of the rental period is flexible and can be adjusted to your needs, whether it's just a few hours, one day or up to one year. The duration of the rental can also be changed at short notice at any time. Fast service: If required, the equipment you need can be available within 24 hours of your order being received. Linde arranges fast delivery of the rental trucks at the right time, ensuring a convenient experience and no extra hassle for you. Reliability: Our short term rental trucks are fully maintained by qualified Linde-service-engineers and they must pass a thorough inspection before delivery. This ensures that Linde short term rental trucks always meet the high Linde standards as well as legal and safety-related requirements. 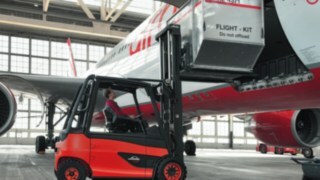 Adaptability: Linde Rental Solutions offer you as much flexibility as you could possibly need. For example, if your application needs change during the hire, we will deliver another truck to fit your new requirements, or we will shorten or extend the duration of the rental without endless bureaucracy. Assistance: The Linde rental service team will be there to help you if you ever need assistance or additional equipment at short notice during your rental. Guarantee: Linde‘s short term rental fleet comes with state of the art technology at affordable prices. This means that you avoid any unexpected surprises, even after the rental has ended. Transparency: All administration and invoicing is simple and transparent. We reduce the amount of administration done to a bare minimum. Satisfaction: The best way to improve our services and solutions is to learn from your experience and advice. Therefore we conduct regular satisfaction surveys with our clients across Europe. Diversity: The biggest short-term rental fleet, with more than 50,000 products around the world. Proximity: Extensive rental service network across Europe. 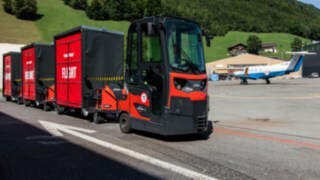 On-site selection: Local Linde partners with their own short term rental fleet. Flexibility: Freedom to choose a rental period of between one day and one year. Transportation: Delivery and collection service for rental trucks provided by Linde on request. Service support: Support from the Linde service team whenever and wherever you need it. Accessories: A wide range of attachments, batteries and chargers. Assistance: Training opportunities for drivers. Rent-to-own: A straightforward way of trying out a truck before you buy it by renting first. Linde's short term rental service network is so extensive that you can always be sure to find a contact person near you. The material handling equipment industry has long been a pioneer in electro mobility. The challenge: to achieve the same high vehicle availability as with combustion engine powered vehicles. This is where Linde's Li-ION technology demonstrates its strengths. 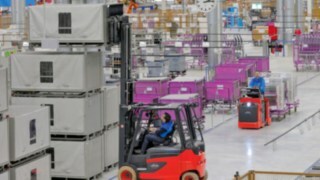 Every year at Agua Mineral San Benedetto in Valencia, 600,000 pallets are loaded onto trucks using Linde forklifts and delivered to customers. The beverage business is booming in summer. 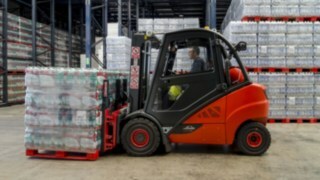 Agua Mineral then uses the flexible and reliable Linde rental service. For four years now, the Renault Sport Formula 1 team has been using Linde forklift trucks to load all of the equipment, and to assist with construction at the racetrack, right across Europe. So far, the partnership with the rental truck team - Short Term Rental - at Linde UK has proved to be both reliable and flexible for Renault. With the motto "Vision ZERO. Safety in your world Linde" Material Handling is represented for the first time at the A+A in Düsseldorf. At the international forum for protective equipment, occupational safety and health at work, Linde will be presenting a new range of consulting services, the Linde Safety Scan. The Linde Rental Solutions has been ensuring fast and professional setup and dismantling as well as performing other logistics tasks at the Formula Student Germany for many years. This requires a number of challenges to be overcome. A Linde tugger train ensures the material supply for production. It stops for the loading and / or unloading of the various aircraft parts, from the small screw to the larger metal parts, at 30 fixed stations. Every four years the biggest Public Viewing Germany takes place on the Fan Mile in Berlin. 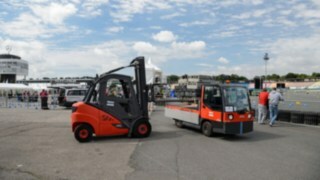 This event would not be possible without the use of Linde forklifts. A complex interplay of man and machine exists whereever industrial trucks are in use. The Linde Safety Guard is an innovative monitoring system that provides an early warning of potential hazards. For users, Linde Material Handling is the most popular material handling equipment manufacturer. This was the result of a survey conducted by the trade journal MM Logistik. Respondents praised the quality, performance and availability of the vehicles. Linde also scores highly in terms of service and training.